DAAS is a model-based asset monitoring solution that utilizes data from historian repositories to detect and report asset failure events before they become critical alarms or catastrophic failures. 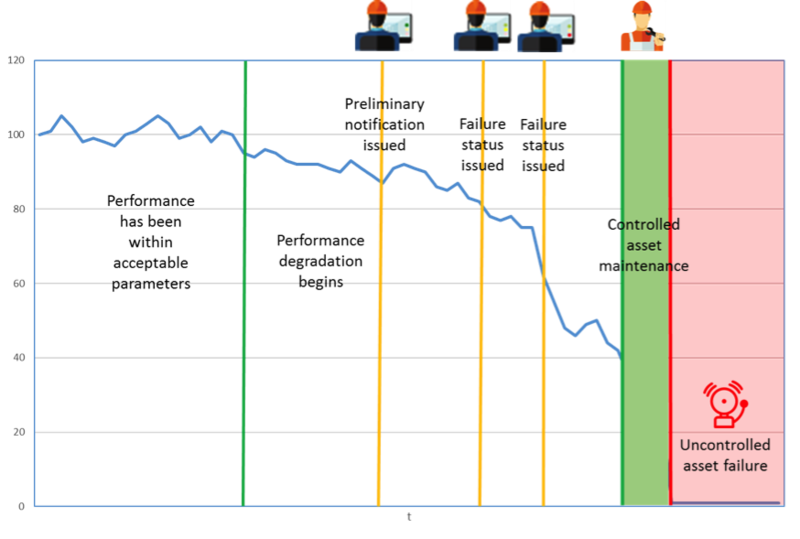 The system monitors when asset performance dips below acceptable parameters and continues to degrade. Instead of the performance quietly degrading until failure, like in a typical alarm scenario, DAAS will issue warning a notification when the performance starts to degrade and issue updates as the performance continues to degrade. One of the biggest things that sets DAAS apart is that it is vendor-agnostic and asset specific. The business models of most asset vendors and OEMs are centered around the initial sale of the asset and the post-sale provision of parts, repairs, or specialized technical services. The DAAS business model is based on the belief that our success comes from delivering the maximum return on investment for our end users. This means, unlike the vendors and OEMs who stand to benefit financially from an asset failure (because it means they get to sell a bigger repair or more replacement parts), Dexcent only stands to benefit when the DAAS system allows our clients to detect issues as early as possible, maximizing your cost avoidance factor and minimizing your maintenance costs. DAAS works in the best interest of you, our end user. Period. DAAS is a solution that performs complex pattern analyses of time series asset data, regardless of the asset type, origin, or manufacturer. Unlike proprietary OEM specific applications, DAAS cross-analyzes data from different OEM assets to determine which piece in a multi-asset configuration is truly at fault, and which assets are just contributing to the readings and creating false positives. DAAS delivers the maximum return for your APM investment by providing a subscription-based asset monitoring and analysis platform. Once the DAAS Core is in place, users select the plug and play Asset Instance Components (AIC) for the assets and failure modes that are their real pain points. AICs can be enabled for short runs to solve a specific procedural problem, or engaged permanently, depending on the user’s needs. Custom AICs can be developed to meet any specialized user analysis requirements. Alarms happen. DAAS was created on the simple premise that by the time an alarm sounds it is already too late, so much so that if an asset does get to the alarm state, we think DAAS has failed you. Though it does happen that an asset can fail suddenly and without any prior symptoms, in most cases fixed or mobile assets present early warning signs of potential failure. DAAS monitors and detects failure patterns as they emerge, advising you initially that there is a problem and then advising you along the way as the condition degrades – allowing you to optimally plan your asset maintenance and part procurement. Most mature organizations are used to predictive asset health solutions. Less mature companies may be more familiar with basic OEM alarms. DAAS notifications take the game to a new level by providing prescriptive outcomes. A DAAS prescriptive notification will typically contain all the information needed by the planner and technician. DAAS eliminates the common problems associated with the automated analysis of near real time streaming asset data – missed or prematurely terminated calculations caused by gaps in the time series data. DAAS does not use data extrapolation to bridge those gaps. We found that too often the extrapolated values glossed over a failure event, or that the data gap actually was caused by the asset failure. In either instance failures, or the start of a failure, can go undetected. This DAAS approach allows the execution of complex, multi-value degradation analyses; multi-level notifications; and cumulative event tracking that can span shifts, days, weeks, even months. DAAS allows you to more effectively manage labour and capital resources to meet fluctuating, often unpredictable, maintenance demands. As noted above, the earlier asset health issues are detected, the earlier you’ll be able to plan and schedule repairs. When you can optimally schedule repairs before issues get too big, you’ll save on expensive parts and replacements. When it comes to asset management, organizations will often accept vendor-supplied systems that only monitor that particular vendor’s assets. The issue with these systems is that they operate in isolation and are unable to correlate inputs from the collective of all your assets. Because of this, your IT/OT department is tasked with supporting multiple AMS solutions when all you want is a single source for all asset health information. DAAS, because it is vendor neutral, is able to bring all monitoring into one application and integrate the results with your existing AMS, CMMS, Notification, or integrated control systems. This results in an overall reduction in IT/OT infrastructure and support expenses. It has been a long-standing challenge for companies seeking to implement condition analysis to resolve issues caused by gaps in the streaming data feed. These gaps cause calculations to be prematurely terminated, or skipped entirely. The usual approach, to extrapolate the missing values, often results in inaccuracy and a lack of confidence in the results. DAAS eliminates the guesswork by delivering real results, based on real data values, in near real time; giving you actionable results you can trust. We view people as your most important assets and protecting people your main concern. DAAS can monitor a wide range of operating procedures - detecting and reporting unsafe or inefficient procedural practices as they happen rather than waiting for end of shift, or the end of month safety reports and meetings. Behavioral change is most effectively realized when the events are fresh in everyone’s mind. While the generic approach to alarms found in OEM and third party APM solutions will capture the sixty percent of potential failures that are the low hanging fruit, the other forty percent requires complex analysis of correlated data from multiple sources to detect, something others are unable to do. Because of this complexity the last forty percent usually go undetected and unreported. Unfortunately, some of the costliest asset failures can be found in that last forty percent. DAAS’ unique approach to time series data analysis and the ability to provide custom AICs allows you to get to the valuable fruit at the top of the tree. If your organization is looking for better industrial asset health monitoring, wants to get that last hard to reach apple, or is interested in obtaining the DAAS difference to improve your overall asset management strategy, contact Dexcent today.